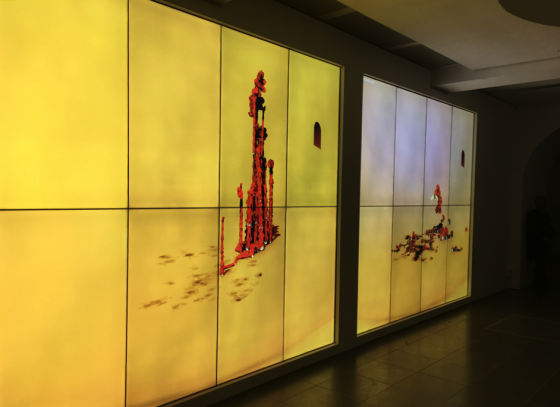 Ian Cheng, BOB, 2018, Serpentine Gallery. Photo by author. Actress, the electronic artist and producer whose records have been described as “audio communions”, pushes listeners into new dimensions set in the near future, the sounds of which are unfamiliar and require exploring. His latest record, Young Paint, takes its name after the AI that wrote the album with the producer. Young Paint was given the ability to select genres, make impression choices (such as creating a ballad or groove), and determine composition elements like tension and fluidity. Once these were inputted “the rest was its own musical speech, or some might say syntax”. We are no longer standing on the brink of a technological revolution but rather living through it: the Fourth Industrial Revolution. In this era exponential, non-linear advances are being made in the field of artificial intelligence. Perhaps of greater interest than the numbers, however, is the increasing ability of AIs to exhibit cognitive functions similar to ours and, in so doing, compete with our creative capabilities—as is the case with Young Paint. Several digital neural networks have taught themselves, and continue to learn, how to combine literary, artistic, or musical rules by consuming enormous amounts of pre-existing works and then generating their own. Purely computer-generated works exist amongst us, and the connection between the human (or team of humans) behind the AI’s technical growth and its resulting creative output becomes increasingly tenuous. Despite being originally trained in speech recognition, after listening to a piano piece, WaveNet produced its very own composition. Similarly, Ian Cheng’s BOBs (Bag of Beliefs) are completely auto-generative. Cheng cannot control the personalities of his BOBs: their individual lives are influenced by audience members. Each BOB experiences the world through as many as 25 senses, which it continuously re-evaluates, thereby building a memory. Much like humans, BOBs can be susceptible to mind-body dissociation and even dysmorphia. If a visitor grinned at the BOB whilst hurting it, the BOB would associate physical pain with happiness. Each and every interaction had with the audience during the BOB’s lifespan at the Serpentine affected its personality and development. Those who had an uneventful interaction with the likes of Chief Horrible Celia cannot seek redress from the artist. Interacting with Chief Horrible Cecilia, one of Ian Cheng’s BOBs. Photo by author. Currently, copyrights associated with, for example, Young Paint’s production or a BOB’s graphic frames continue to vest in the human producer and artist, under local copyright laws. A cross jurisdictional analysis will illustrate that, with the exception of a provision in the UK’s Copyright, Designs and Patents Act 1988 (CDPA), the US, Europe, and Australia are all unwilling and unable to reward AIs for their creativity by granting purely computer-generated works copyright protection. 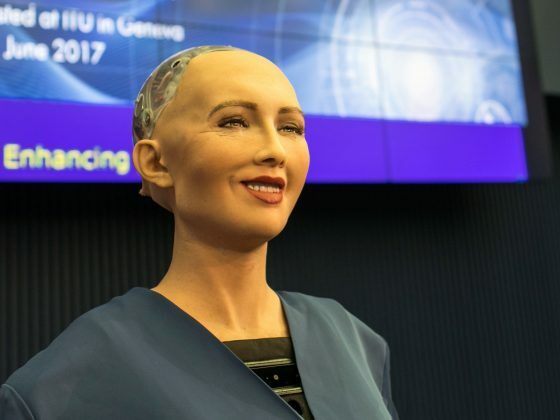 In order to facilitate the understanding of the different regimes, one could imagine that Sophia—the most renowned and helpfully anthropomorphic AI, who recently spoke with UK producer SOPHIE and obtained Saudi Arabian citizenship — might seek copyright protection for a song it created autonomously. Although Silicon Valley appears as a beacon of progress, the US copyright regime is categorically incapable of recognising copyright subsistence in purely computer-generated works. Under the United States Code, the codified body of law that outlines US copyright law, copyright subsists in original works of authorship fixed in any tangible medium of expression, now known or later developed, from which they can be perceived, reproduced, or otherwise communicated, either directly or with the aid of a machine or device. The law clearly denies protection for works created by autonomous machines, as evidenced in the Compendium of US Copyright Office Practices, which notes that to qualify as a work of authorship a work must be created by a human being. The Office further clarifies its position by adding that it will not register works produced by a machine or mere mechanical process that operates randomly or automatically without any creative input or intervention from a human author. If this weren’t sufficient, the same section, at the outset, provides that the Office will not register works produced by nature, animals or plants, including [a] photograph taken by a monkey. This extension was added in light of Naruto et al v Slater, a case which saw Naruto, a macaque, take several photos of himself using the equipment of British photographer, David Slater. The images were then reproduced on Wikimedia, with PETA arguing that Naruto should be assigned copyright, and Slater holding that he had a valid copyright claim. On 28 January 2016 the Northern District Court of California concluded that the Supreme Court and Ninth Circuit Court “have repeatedly referred to ‘persons’ and ‘human beings’ when analysing authorship under the Act”. Under current legislation and case law, the US would not find the subsistence of copyright in Sophia’s work. Australia is a similarly unfriendly jurisdiction. Under the Copyright Act, the author of a literary, dramatic, musical or artistic work is the owner of any copyright subsisting in the work. Whilst author is not defined, the Act then uses ‘person’ interchangeably with ‘author’. Sophia would have no greater protection under Australian case law. In Acohs Pty Ltd v Ucorp Pty Ltd the Australian Federal Court upheld a decision at first-instance involving two companies, both of which developed software that would automatically fill out health and safety forms. Acohs’ system would procedurally create a new document on demand. Ucorp was accused of extracting the resulting HTML code (and with it the formatting, layout, and appearance) and copying Acohs’ outputted form. The first-instance judge had ruled that the source code had no copyright protection, as it was generated by a system and had “no single human author”. On appeal, the Federal Court upheld this position stating that since the code had not originated from human authors, “it was not an original work in the copyright sense”. Australia’s Copyright Review Committee had identified the strict bond between personhood and authorship as problematic already in 1998. This sentiment was echoed by the President of the Australian Computer Society, who recently noted his disappointment in finding that neither the Australian Productivity Commission Review of IP Arrangements nor the Federal Government had mentioned AI or autonomous technologies in their response to a 2017 report on Australia’s Intellectual Property Arrangements. Shunned once again, Sophia may find herself in a more favourable regime here in England and Wales. Unlike the previous two jurisdictions, the CDPA recognises copyright in computer-generated works by virtue of s 9(3), which states that in the case of a literary, dramatic, musical or artistic work which is computer-generated the author shall be taken to be the person by whom the arrangements necessary for the creation of the work are undertaken. A computer-generated work is defined in the CDPA as one generated by a computer in circumstances such that there is no human author of the work. Copyright could therefore subsist in Sophia’s musical work, although Sophia would not be taken to be its author. Instead, this right would most likely belong to the team at Hanson Robotics or perhaps David Hanson himself. 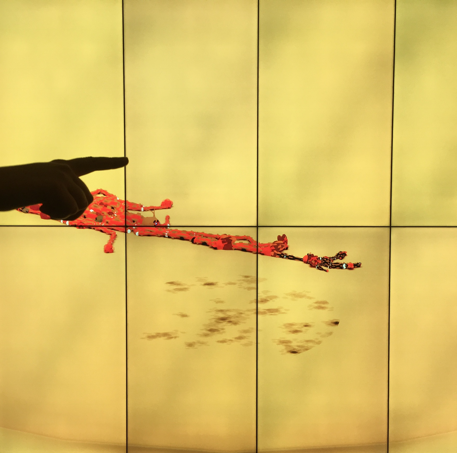 Using Chief Horrible Celia, one of the BOBs as an example, it could be argued that any visitor has influenced her development and, as such, could hold rights with regard to individual frames produced on the Serpentine’s screen. A similar but far more tangible argument was run before Jacob LJ in Nova Productions v Mazooma Games. The plaintiffs, who designed arcade games, argued that Mazooma had produced two infringing games, as their graphics and frames were similar. The judge noted that for the purposes of s 9(3), the individual frames on screen were computer-generated works, but authorship under the same would be awarded to the game’s programmer. He further touched on the user’s input, adding that whilst frames are dictated in part to the specific player gaming “his input is not artistic in nature, and he has contributed no skill or labour of an artistic kind”, thus denying him authorship. What if Sophia interacted with Chief Horrible Celia in such a way as to constitute artistic input? Or, more practically, what if a person continued wandering through an open-ended, auto-generated VR game, affecting its structure to a material degree. Would they be able to claim authorship over the resulting landscape, or individual frames? At present the position seems too unclear. The lack of clarity is exacerbated by EU law. Under EU law there is no general equivalent to s 9(3), and most continental jurisdictions either implicitly or explicitly, as is the case with Spain, award authorship to the natural person who creates an original work. The European test for originality is contained in Infopaq, where the CJEU declared that a work can be protected by copyright if it is the author’s own intellectual creation, reflecting his personality as specified in the Preamble to the Copyright Term Directive. These specifications make it harder for purely computer-generated works to be afforded any protection. Anthropomorphic AIs such as Sophia may find it easier to display a specific personality, but an average AI generating source-code might have difficulties. English courts have incorporated the Infopaq definition in cases such as Temple Island Collections  and Football Dataco  causing commentators to opine that the English standard of skill and labour, now conflated with the notion of intellectual creative effort, has reduced the strength of s 9(3) for computer-generated works. Even if one chooses to affirm s 9(3)’s value, the expansion that was initially envisaged by the 1998 Act is now outdated. Works, such as a completely autonomous production by Young Paint, would merit copyright protection, but are beyond the point of being granted it, either because (i) they cannot fall within s 9(3) due to Infopaq‘s tainting or (ii) if they do fall within s 9(3), copyright would be awarded to the person by whom the arrangements necessary for the creation of the work are undertaken when, in many cases, that person could be too far removed from the composition for it to be fair. The US, UK, and EU have indicated that they will further review this area of the law; however, this revision should be done imminently. As digital law specialist Professor James Grimmelmann notes “copyright law has concluded that it is for humans only […] Copyright ignores robots. This…is…consistent with copyright’s own theory of the romantic reader”. Yet Japan has already taken a step forward in understanding what legal frameworks need to be put in place in order to accommodate for creative and original works produced by AIs, by setting up a dedicated task force. The very romantic notion mentioned by Grimmelmann will serve as a starting point when discussing Europe’s historical entrenchment of authorship and personhood, as detailed in the Berne Convention. Looking at various models, ranging from the deontological to the utilitarian, and reading through Japan’s proposals will illustrate that options for the regulatory future of tomorrow can and should be tracked. This mapping exercise should not only be for the sake of future royalties from Sophia’s new hit, or Young Paint’s joint authorship rights, but also for their employment rights and potential liabilities as AIs. These laws may be unfamiliar, but they require exploring. Although critics have pointed out that GANs had been used in the past, making this less of a ‘novel use’ as was advertised. Parliament of Australia, ‘Simplification of the Copyright Act 1968 – Part 2: Categorisation of Subject Matter and Exclusive Rights, and Other Issues’ (1999) 15 Research Note 1, at 2. Giulia Trojano works for international law firm Withers as a trainee solicitor, with an affinity for art law. Currently based in Milan, she regularly writes for FAD Magazine and is assistant editor of the recently launched broadsheet, Art of Conversation. She is particularly interested in advancing legal and political discourse through a close study of contemporary and experimental art forms. Giulia graduated from the LSE with an LLB in Law and prior to that lived in Rome and Vienna.